Sisal Creative is a South Carolina-based company that designs and implements creative, brand-centered art for, "any storefront, lobby, café, museum, hotel or wall at home." With a variety of projects of all shapes, sizes and scales, the brand creates immersive artistic experiences with a look and feel that's tailored to the client and the event. It would take quite a mind to develop that kind of a business concept, much less make it all work, and the creative mind behind Sisal is Becca Barnet. The artist-turned-entrepreneur is a graduate of the Rhode Island School of Design (RISD) where her creative interests ran the gamut from sketches to sculpture and back. Today she continues both her artistic and business interests from her engagingly colorful home in South Carolina. 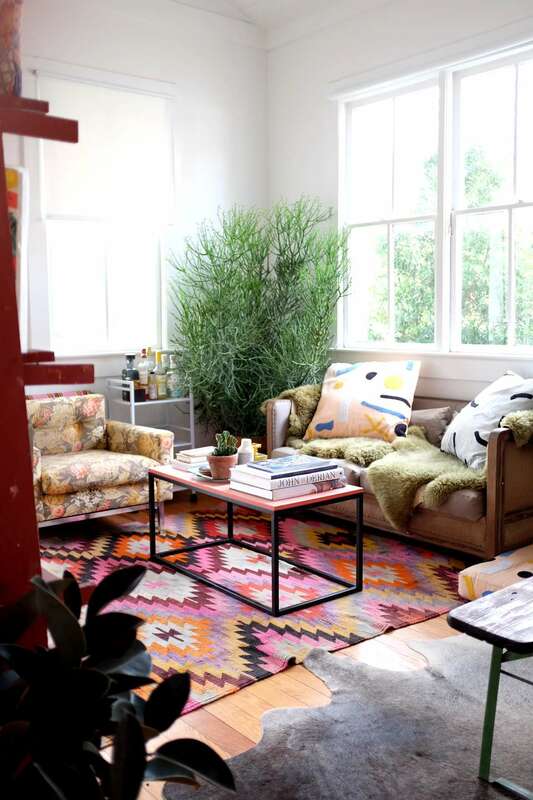 This wonderfully bohemian home starts with a living room that encompasses a wide array of influences, colors and patterns. Quick to take center stage is the stunning geometric rug that dominates the floor space. Incorporating neutrals such as white and black along with bright and bold shades of yellow, orange and red, this rug is the perfect piece for creating a living space that intends to showcase a wide-ranging color palette because every color in the room can be connected through the rug. The mesmerizing zig-zag of the rug's geometric pattern is also a perfect counterpoint to the soft, floral design of the side chair and the abstract, organic pattern of the pillows. The living room is a part of a larger, open-plan space that extends through an intimate dining area into the kitchen. Immediately apparent are Barnet's love of both wall art and plant life. Vibrant, green life abounds equally in the living, dining and kitchen sections of the space. At the same time, hanging art pieces in the kitchen and dining room display floral patterns and detailed descriptions of plant anatomy, respectively. The dining room is a simple and rustic arrangement of park-style benches flanking a taller table. The square, metallic legs of the table and its accompanying benches echo the material and style of the legs on the coffee table in the living room, while the warm wood tones that top the entire dining room arrangement pick up the colors of the floor as well as that of the plant pots on the kitchen counter. The combination of natural plant and wood tones add a warm and relaxing note to a space that could otherwise be overstimulating. Completing the look is a soft, cowhide rug. Though clearly intended to define the dining space, the cowhide rug is layered beneath the living room rug, creating connection between the spaces even as they distinguish them. Further connection comes from the repetition of animal skins in the green lambskin throw on the living room sofa. In the kitchen we get a closer look at the artist and businesswoman's chosen color palette. Cool material surfaces such as the stainless steel of the refrigerator and the stylish, marble countertop are offset by the natural greens and browns of the plants. This warms the space, making it feel vibrant and alive rather than sterile and functional. This is a minimalist and highly effective way of decorating a kitchen with colors that take it beyond it's role as a functional space. Looking back into the living room from the kitchen it becomes apparent how well the shared elements between the different areas in this open-plan spaces help to create clearly defined spaces that are, nevertheless, visually connected and coherent. Small touches like the pops of yellow on the stove and beside the sink and the small area rug help to complete the kitchen. Art is invariably one of the most important elements and direct statements that any room can make. With this piece, Becca's home affirms her love of abstract shapes and pieces with an earthy, hand-made feel. It also includes one of the home's most consistent warming elements - wood. Like the kitchen, the bathroom is a utilitarian space that offers several design challenges. But Becca makes it look easy by keeping things simple. Warm colors, plants, and just enough rugs to keep things interesting are all this powder room needs to keep up the stylish standards of this home. Small, relaxing moments like this are a must in every home. A rocking chair in a quiet corner is all you need for hours of ease and comfort. The art that makes up the gallery wall above is an interesting mix including everything from framed pencil sketches to black-and-white photographs of chickens in a coop. In the bedroom, much of the rustic, bohemian aesthetic of the earlier rooms gives way to a surprising sense of glam as Barnet fully engages her love of yellow. Several of the elements from the rest of the home are present. Warm woods, plenty of plants and a variety of quirky and intriguing works of art all make an appearance. Most of the change in aesthetic actually comes from the large, luxurious-looking piece of art hanging over the bed. Intricately patterned wth several levels of design, it's a piece that is fully capable of transforming a room - which is exactly what it does. Yellow is far from being the easiest color to decorate with, but you'd never know that by looking at this room. Barnet blends shades of the bright color in doses that are far more than pops. They are full-fledged parts of the color story. Here we get a closeup look at how the bedside lamp, bedding and art all work together to mix different shades of yellow at different levels of the decor. As an artist, Becca has had a long held fascination with temporality and the human desire to "hold on to the fleeting corporeal." It's an interest that has had an impact on much of her work. In addition to RISD, Barnet also attended the Missouri Taxidermy Institute, where she found that she had a special capacity for the taxing practice of preserving animals. In her home, taxidermy is part of the art, contributing to a display that sits at the entrance of her bedroom.